Sweep The Leg With Johnny Lawrence's Screen-Worn Cobra Kai Gi From "The Karate Kid"
WANT OVERLOAD. Can I borrow me $100,000? This is actor William Zabka. He portrayed the petulant bully, Johnny Lawrence, in 1984's "The Karate Kid". 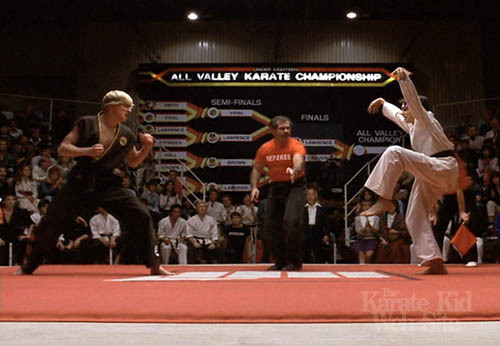 Garbed in a black and yellow Cobra Kai karate gi, Lawrence is seen here in the film's climactic sequence, squaring off against Daniel LaRusso for the All Valley Karate Championship (and, more importantly, the affections of '80s megababe, Elisabeth Shue). And now, by the grace of the film gods, you can own this very important piece of movie memorabilia. All for a measly $100,000. This Cobra Kai gi was worn by William Zabka's character Johnny Lawrence during filming of the 1984 movie The Karate Kid. We obtained the gi on eBay from a collector who purchased the gi from ReelClothes.com. The gi comes with a framed Certificate of Authenticity from ReelClothes. Kevin Stecko, the founder of 80sTees.com bought the gi because he always wanted to wear an authentic Cobra Kai gi for Halloween. We used this gi to create copies which we sell as our Exclusive Movie Quality Cobra Kai Costume. As you may be guessing by the price our goal is not really to sell the gi as much as it is to put it out there for the world to appreciate. The Karate Kid is Kevin's favorite movie of all time and he wanted other fans to be able to see this amazing piece of 80s movie history. It evens comes complete with a certificate of authenticity. BOOM! The good news: take advantage of their social offer and you can save 20%! But if that seems a little steep, you can buy the same garment, only awesomely 8-Bitted to accentuate the post's nostalgic qualities. So. Many. Feels. Right. Now. Have a spare $100,000? Guess what! You're in luck then!